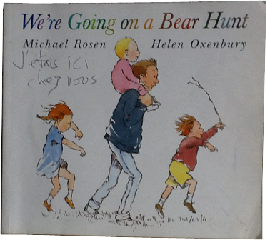 Babelkid - Raising Multilingual Children: "We're Going on a Bear Hunt"
We're still slightly floored... Michael Rosen and his producer Beth O'Dea just left our house about an hour ago. Michael interviewed us for an upcoming episode of Word of Mouth on BBC Radio 4. We're obviously really looking forward to listening to the result! Plus the girls like "We're Going on a Bear Hunt" as much as we do. Oh wow! This is my daughter's favourite book in the whole world - and I love reading it to her! How exciting. Hope you can record and share that with us. We love the book too! Just wanted to say I listened to the program this morning. It was lovely to hear you all. I felt like I got to know you a bit better! Did iplayer work in Germany then?